Jigsaw Piece is a compact digital jigsaw puzzle application that enables you to turn your own digital still photos, illustrations or other pictures into quaint computer jigsaw puzzle games. The game features intuitive piece-handling system, which allows you to soak yourself in naturally realistic puzzle-plays. *Jigsaw Piece is available for Universal Windows® Platform. PC, tablet or another device running Microsoft® Windows® 10 is required to use the application. *Microsoft and Windows are either registered trademarks or trademarks of Microsoft Corporation in the United States and/or other countries. Easy puzzle creation in just 3 steps: 1.Choose a picture, 2.Select #pieces and 3.Break it up. Natural piece-handling: Intuitive piece move and 360deg-rotation by two-point-touch or wheel-mouse. Background preference: Selectable background texture (cork, felt or checkered-cloths) and color variations. Puzzle screenshot: You can take a snapshot of the puzzle in progress at any time. Sample pictures: A dozen of ready-to-play sample pictures included. 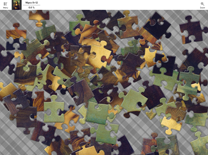 If you'd like to know about the app further in details, please watch the movies: Jigsaw Piece - Puzzle Time Lapse.